Nothing’s changed and yet everything is changing at our remodel on San Juan Island. We are still strung between homes and living on a boat in Friday Harbor. I commute to Seattle once a week to water plants, sweep walks, collect mail, and run my writing workshop. There, I sleep in my clothes because realtors have been known to come to the door for showings in the early and late hours. I try not to mess a thing while the house is on the market, but to leave it picture perfect. Not really home anymore. And the job site is still just that, a job site. Not home either. If anything, Friday Harbor Marina is starting to feel like home. Ferries come and ferries go, and the rhythm of it all…. One day I’ll be looking back at this time with a certain nostalgia, that I know. Life is simpler on a boat. It’s amazing how much stuff one doesn’t need. Just the book you are reading and the clothes you are wearing. The elbow-to-elbow closeness of neighbors sharing the same dock. Blinded by fog, and glowing in sunsets together. The sway of the boats in currents and gentle rolling with waves. The symphonic sounds of wind whipping through halyards and mast stays (flutes). Hulls against rubber fenders (violins). Creaking of pilings against the dock (a cello). Humming of stays (clarinets). And sleeping in our berths on board boats that are talking to each other in the night. Things are going up, however, at the house. Until now, I had to close my eyes to picture anything we had specified. 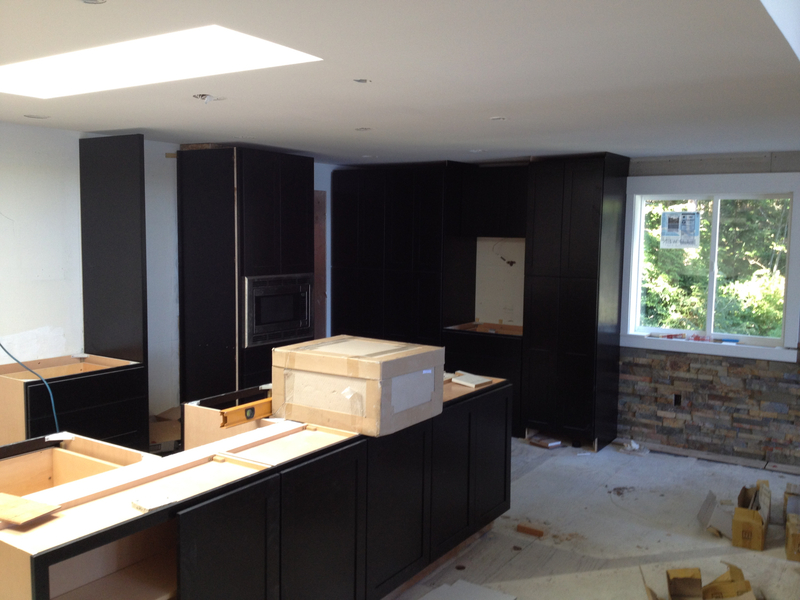 Now, with the kitchen cabinets in, I can start to see with eyes wide open. How handsome they look in an expresso brown that’s nearly black, standing about like so many waiters in a cafe wearing white shirts and long, pressed black linen aprons over pants. The kitchen was central to our plans; it’s only right that that go first. And as the materials go up, color and texture start to come in to play. Followed by music. One can almost hear it.